University of Toronto Political Scientist Randall Hansen has been awarded the Canada Research Chair in Global Migration. 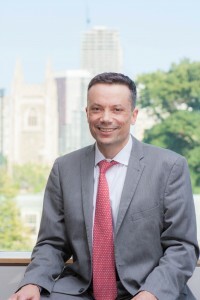 Professor Hansen is the Interim Director of the Munk School of Global Affairs and the Director of the Centre for European, Russian and Eurasian Studies. His fields of research are migration and citizenship, eugenics and population policy and the effect of war on civilians. His published works include Disobeying Hitler: German Resistance after Operation Valkyrie (New York: Oxford University Press, 2014), Sterilized by the State: Eugenics, Race and the Population Scare in 20th Century North America (New York: Cambridge University Press, 2014), Fire and Fury: the Allied Bombing of Germany (Penguin, 2009), and Citizenship and Immigration in Post-War Britain (Oxford University Press, 2000). Fire and Fury was shortlisted for the Governor General’s Literary Award for Non-Fiction in 2009. He has contributed numerous articles to academic journals, the national and international press and appears regularly on TVO’s The Agenda. The Canada Research Chair program was established in 2000 as a part of the Government of Canada’s efforts to promote research and development excellence in Canadian post-secondary educational institutions. Through the Canada Research Chair program, $300 million is spent annually to attract and retain outstanding scholars and scientists. The program hopes to help chairholders achieve research excellence in natural sciences, engineering, health sciences, humanities, and social sciences, improve Canada’s depth of knowledge and quality of life, strengthen the country’s international competitiveness, and train personnel through student supervision, teaching, and the coordination of other researchers’ work. Hansen is just one of 16 U of T researchers awarded a new Canada Research Chair this spring. Another 12 researchers at U of T had their chairs renewed or advanced. For a complete list please visit the U of T News website.